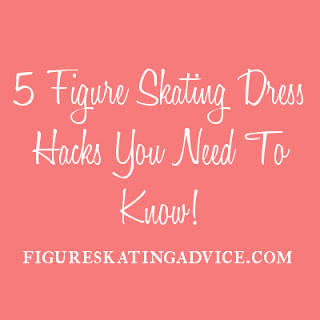 So, without further delay, here are my top 5 figure skating dress life hacks that will make your skating life easier, and may even get you out of a tight spot right before a competition! Do you have a dress that's made of velvet or Tactel which have glitter all over it? Is that glitter falling off? This is a really common complaint in skating, because these fabrics can't hold all the glitter that you saw when the fabric was on the roll, throughout the entire life of the garment. So what to do? Step one... spray your dress with appropriately coloured glitter spray! Remember to respect the distance you should spray from (it'll be noted on the can), and to spray onto a test patch first (such as the armpit area) to be sure it doesn't discolour your fabric. Step two... when you're happy with the look, finish off with hairspray! Be sure to do all the spraying in a well ventilated area, preferably with the garment hanging up. Don't expect no glitter to ever budge again, but this will definitely spritz up a dress pre-comp! Yep, you've heard this before if you're a regular on the blog... tame those frays with clear nail varnish! Right before your event this is the easier way to make sure your chiffon hem line doesn't unravel, seem unsightly, or leave fraying reams of thread on the ice. The better option is to eventually have it re-hemmed, and make sure that the chiffon is properly overlocked (a technique which covers the edge of the skirt in thread to avoid any loose threads from coming loose which is achieved by a special machine called an over-locker or by using an over-locking setting on a sewing machine which has this functionality). You know, you stuffed it in a dress bag after the last comp/test/gala, and now you've got it out the day before your next event and realise it could do with a freshen up?! No time to wash it, because it's made of heavy velvet and it is crystal encrusted (and that would take like a week to try!)? No worries! Use a soft furnishing freshener spray available at your local supermarket on the problem areas (most likely the arm pits), and hang the dress up in your bathroom. While you're taking any baths and/or showers, the steam in the room will help iron out any creases or wrinkles (e.g. in chiffon skirts) and the odours from your bathing will help to make your dress smell fresh again. You could always even add a few drops of an essential oil you love to a basin of hot water, and hang the dress near by so that the scented steam wasfts towards the dress. Please note that you should test patch any products you use on your outfits in an un-seen place (arm pit, knickers under the skirt, etc.) and that you should only use products that won't cause you any allergic reactions. #5 Yikes! My child grew and now the skirt is waaaay too short! 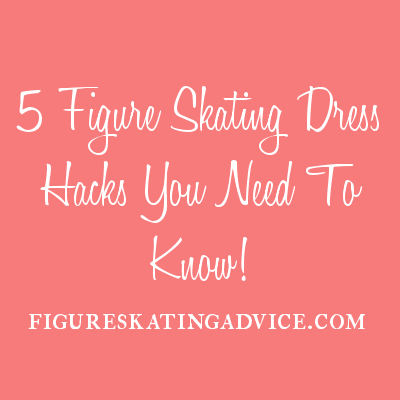 You'll be well aware that figure skating dresses can cost a small fortune, especially the competition variety, so what to do when your kid grows out of that $300 dress from the beginning of the season? Revamp it! For just a few dollars (dependent on getting cheap chiffon) you can get a whole other season out of that dress. Have your dressmaker take off the current skirt, and replace it with a new, longer version, and keep the bodice. This also gives you the opportunity to make a new-version of the dress! I had a purple velvet skirt replaced with a white chiffon dance skirt, and it changed the whole look for a total of about $10! Whoopee!! Well I hope these 5 tips for dealing with dress issues were helpful to you! If you have any thoughts or advice for others readers, you know what to do! (*cough* leave a comment *cough*). Until next time, keep looking fabulous! Thanks for your tips. Can I ask if dry-cleaning will affect the glitter glue spray and hairspray in tip #1? Hi @Cee and thanks for writing! In all honestly I can't say because I've never dry-cleaned a dress. My bet would be that if you dry clean a dress after having used the hair-spray trick, it will strip the hairspray off. How much glitter would come off too is to be discussed with your dry cleaner if you are concerned, it wouldn't surprise me if the chemicals used stripped a bit of that off too. Also, just to clarify, I'm talking about those glitter sprays you can buy in such stores as Claire's Accessories that are for your hair and body, not glitter glue from a crafts store. Hope that helps! Let me know how it goes if you do dry clean it I would LOVE to edit the post and let all my readers know how it turned out for you Cee! What brand do you recommend to buy for glitter spray to jazz up a light teal velvet skating dress daughter is skating to Disney frozen song let it go dress little sequence and a few rhinestones but not enough to glisten on the ice.